December 9th Holiday Party, Ornament Raffle and Gift Swap. Doors open at 5:00 pm, at the Seventh-Day Adventist Church, 653 W Fremont Ave, Sunnyvale CA 94087. Claude Godcharles prepared an excellent	projection of each piece judging critique sheet See it all here This was a real learning experience. The judges were picky but but that's how we learn. Many thanks to the judges and to those who submitted pieces and those who worked so hard to organize the competition. We are approaching the end of the calendar year for West Bay Woodturners and as such it is time to turn over the reigns of WBW Board leadership to new hands. This is an important juncture for the membership. The good news is we have three of the board members offering to run for reelection; Bud Trapp for Treasurer, Ken McCloud for Secretary and Bob Bley for at large member (proposed, but need confirmation in January). That means we only need candidates for President and Vice President. Sadly, Pat Crowley (VP) and myself (Pres) can not run for office again because our by-laws do not allow more than 4 consecutive years on the board in any elected position. I am asking all of you to consider submitting your name as a candidate for President or Vice President. I am committed to helping any new member to organize and manage the elected office. I will provide leader ship, sharing of files/documents and attend board meetings till the transition to the new offices is complete. Without an elected board the club can not function, so I urgently request that you consider running for office. It is not that difficult a task and it is great fun to be steering the club in a direction you prefer. Special Saturday November 8th Professional Demonstration with Mike Mahoney Because the board is committed to giving back to the membership, it has been decided to offer a discounted admission of $10.00 for members, friends and students to this special demonstration by Mike Mahoney (see Flyer on the club Web Site – see the flyer) Anyone who has seen Mike demonstrate can attest to this speed, skill and knowledge in bowl turning. If you have been holding off coming to an artist demonstration, because of the time, location or price, then this event is for you. The price is $10.00 for members and friends (what a deal), students are free, date is Saturday, November 8th, 9:00 AM, at our usual meeting location, Bridges Church. Don’t miss this event. I will be passing around food signup sheets at the October meeting for our annual Christmas/Holiday party. This event to be held at the Seventh-Day Adventist Church, 653 W Fremont Ave, Sunnyvale CA 94087 is always a fun highlight of the year. All members are encouraged to attend, whether or not you have something to bring or share. As many of you know, in addition to the Holiday dinner we also have a Christmas Tree Ornament raffle/club fund raiser. You can help the club by starting now to turn ornaments that can be donated to this event. And last, but not least, we will be holding our annual turned gift exchange. To participate, bring a gift wrapped item you have turned and you will be entered into the gift exchange. I look forward to seeing you in the upcoming events and please consider submitting your name as a candidate for President or Vice President. You will find that the more you give to West Bay Woodturners, the more you will enjoy the experience. Once again I need to apologize for the delay in getting the free wood turning hands classes scheduled. This will be a priority for the September board meeting, so keep on the look for the upcoming announcement. 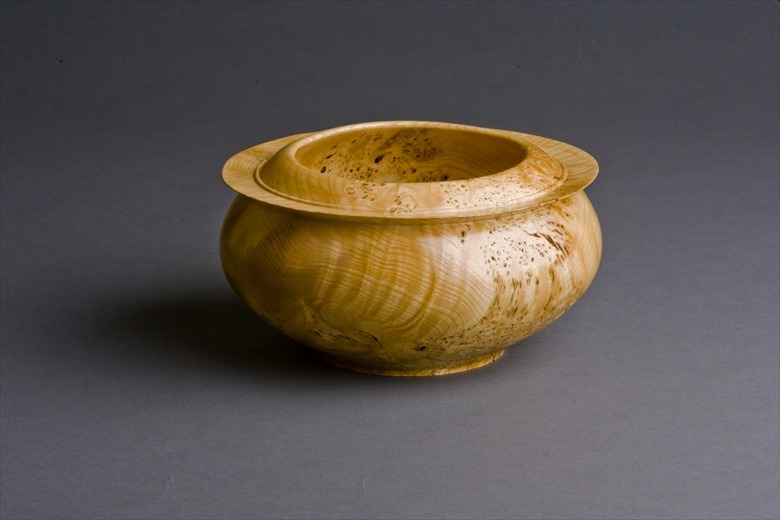 As described earlier this will be a free wood turning hands session by Barry Uden, which will focus on Bowl turning, sanding, reverse chucking, finishing and more. Whether or not you attended the earlier sessions, you will gain valuable insight and hone your skills at this class. We have plenty of room to accommodate all members that are interested in attending these sessions. Don’t forget, if you don’t have a shop made Name Badge you can’t be part of the monthly raffle. So get busy turning.